alaTest has collected and analyzed 10 reviews of DELL XPS 15 15.6 Laptop - Silver. The average rating for this product is 4.4/5, compared to an average rating of 4.1/5 for other products in the same category for all reviews. People really like the portability and battery. The design and performance also get good comments. There are some negative reviews about the keyboard, while reviews about the reliability and size are mixed. We analyzed user and expert ratings, product age and more factors. 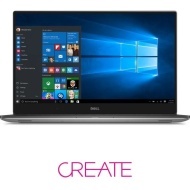 Compared to other products in the same category the DELL XPS 15 15.6 Laptop - Silver is awarded an overall alaScore™ of 87/100 = Very good quality. Great laptop for development, definitely recommended. Super fast. The keyboard is too small. It also doesn't resemble the image on the website. Just slick and fast laptop. Edited two weddings over 4 days. Keyboard takes a bit of getting used to as the keys are far apart. The fans can be a little noisy. Keyboard is good but if I'm being picky then they could do with a bit more travel on the keys. Laptop feels solid and performs really well. I'm using it for work emails, Photoshop, Illustrator, InDesign with Spotify open. I haven't had much chance to test the battery, but my initial impressions are very good! Speakers are not great. They seem a bit quiet. The graphics driver also needed a manual update to stop Chrome freezing all the time, but this is completely fixed since.